This isn’t really the time or place to get into a long discussion of the pros and cons of recumbent cycles compared with conventional upright machines, nor those of tricycles as opposed to bicycles. I’ll just mention, though, that there are cyclists who like the idea of a recumbent, but find recumbent bicycles very awkward, notably when starting off on an uphill gradient - recumbent trikes don’t have this problem, as they don’t present the balance problems when starting. And of course with a trike you can stop when you want to, without dismounting. 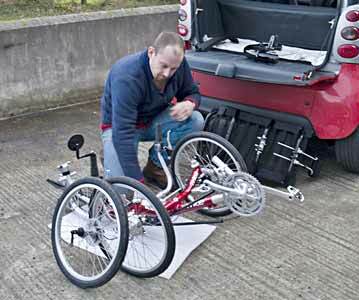 However, both types of recumbent tend to be more bulky, especially the trikes, and this presents problems not just in terms of transport, but also for storage. For 2006, ICE have made some major changes to the standard range of machines, which now also carry the name Trice, with only a very modest increase in price. Although rear suspension was an option on some of the custom models before, it was not previously available on the standard models, but for 2006 it is now fitted on all the standard models as part of the basic specification. In addition, the 2006 standard models are designed to be much more portable (or just compact when stored) - the rear suspension system allows a first, quick, fold, and quick-releases are used for mounting fittings and much of the assembly of the machine. 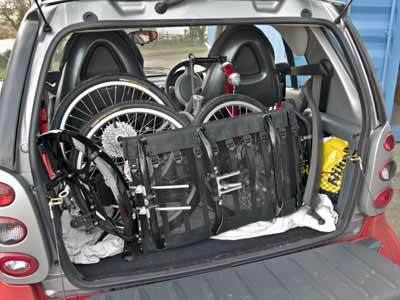 Folding and separating into a small package can now be done quite quickly - certainly still not in a way that makes it a rival for a Brompton for train and cycle commuting, but in a way that makes it eminently feasible to pop it in a small car to take out for a day ride - or even a half-day ride. So we decided we should test one. Before starting the test report proper, it’s important to understand where we approached this from. I have only minimal recumbent riding experience (a few short rides on one of the earlier Bike Friday SatrDay recumbent bikes, and a couple of laps of a car park a few years ago on 3 or 4 different makes of trike). I’m therefore not going to try to make a judgement on how the new standard Trices compare with other recumbent trikes in terms of performance. Clearly, it’s not really comparable with folding bikes I have used in the past either - whether compact commuters or high-performance road bikes. Thus I’m just going to report on the machine as I found it. S - Sport. Longer and lower, and more of a performance machine, though still capable of luggage carrying etc. All the 2006 standard models feature the new rear suspension system, which uses as a suspension member the same elastomer as is fitted to the Birdy (3 grades of hardness, but the way it is fitted on the Trice allows each elastomer to be put into one of 3 ‘preset’ positions, giving some adjustment without the need to change the elastomer). All the frames of the standard models fold and separate (using quick release levers) in the same way - more on this later. The frame is easily adjustable for riders of different leg lengths, quoted as an X-seam measurement of 39 to 48 inches on the QNT (down to 37 inches if shorter, 155mm, cranks are used). The angle of the seat back can also be adjusted to one of 3 preset positions - this can be done extremely quickly, and neither this adjustment nor the leg-length adjustment requires any adjustment of gear cable length. All use 20 inch 406 wheels front and back, which gives a huge choice of tyres and ready availability of spares; some recumbent trikes have a larger back wheel than front ones - not the case with the standard Trices, which means you don’t need to carry different spare tubes, and stock more than one size of spare tyre. Kenda Kwest tyres are fitted as standard, which seem to perform well (the rear one is fatter than the front ones, so if you keep a spare tyre in stock, you do need more than one size). For a trike, slightly more robust tyres are generally desirable, though Stelvios (a narrow, high pressure racing tyre) could be fitted to the front (though they are perhaps a bit fragile for use at the rear). Standard gearing is a 9-speed Megarange 11-32 cluster and a triple chainring - 52/42/30 (with a customer-fitted option of 55 at the top, or 26 at the bottom, but not both at the same time). The standard range is therefore 18.2 - 92.2 inches, or 18.2 - 97.5 for the high option, or 15.6 - 92.2 for the low option. 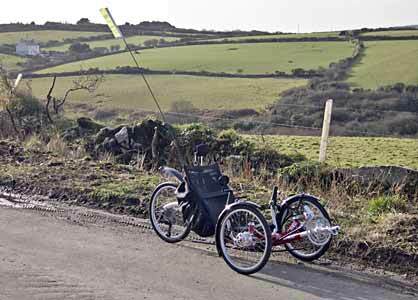 This is a very respectable range, and well chosen, though of course with a recumbent you can ideally make use of some really high gears (lower wind resistance), while needing very low gears for hill climbing. The new aluminium rear fork assembly is Rohloff-ready, though ICE do not offer this 14-speed hub-gear as a factory option (one of the development custom models in the factory had a Rohloff fitted). The standard Trices are very reasonably equipped for such relatively cheap machines, including a rear mudguard (QR fitting and removal), tubes over the long chain run to avoid the rider picking up oil and grease, one mirror and a flag for the rear. There is a wide range of reasonably priced extras, including front mudguards, computer mount, front light mount, adjustable neck rest, chain ring guard, rear disc (parking) brake kit, additional bottle-cage mounting kit (1 set of bosses are standard) and a pack to allow fast (QR) dismantling to a further level. For the test, I went down to ICE in Falmouth. ICE is quite a small company, consisting of just 4 people who are all totally dedicated to the product. The machine I looked at and tried is a prototype, and some details are still being finalised. The fairly simple rear mudguard shown in the early pictures on the web site was fitted (as were the optional front mudguards), but I was also shown a more close-fitting and longer mudguard which can still be mounted via a QR, and would provide more protection for anyone riding behind the recumbent! Incidentally, the prototype was sporting a huge Schwalbe Big Apple rear tyre when I arrived, and the mudguard (and fork) design accommodates just about any tyre you can find in the 406 size! The rear wheel was replaced with one wearing the usual Kenda Kwest for my ride. As with all ICE machines, the quality of the frame is first class, the build-quality seems just as good, and the paint quality too is excellent. There is no choice on colour of the standard models (one of the things which keeps the price down), and a different colour is standard for each model. The 2006 Q and QNT are finished in an attractive deep red colour (‘candy apple red’). 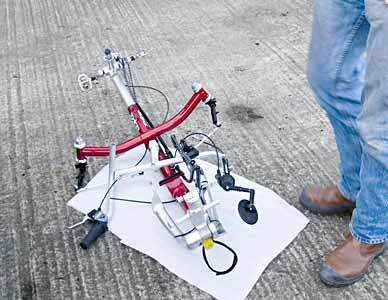 The aluminium alloy rear fork assembly and boom are manufactured in Taiwan, but all the rest of the frame etc is made by ICE in their small unit in an industrial estate at Falmouth in Cornwall. This is of course something you really only need to do once, and unless riders of very different heights are going to be riding very frequently, it’s not a very important issue. ICE publish figures relating to rider height, weight etc, and I won’t repeat that in full here - see their excellent web site for more information. Suffice it to say that I am close to the shortest leg length recommended for the QNT with standard cranks (an x-seam measurement of 39 inches - see the ICE web page for information on how to measure this) - those with shorter legs (x-seam down to 37 inches) can still be accommodated, but shorter cranks are recommended (155mm instead of the 170mm standard ones) - the sizes vary with models, see the ICE web site for more information. The prototype machine I was testing had barely turned a wheel before I rode it, and was set up for someone of more normal stature (I’m only about 5ft 6 inches, with rather short legs). Nevertheless, the only mods required to fit me were to move the boom in a lot, shorten the plastic chain tubes and take some links out of the chain. Adjusting the boom length is very easy and quick - easier still if the machine has QR levers on the boom (these has not been delivered at the time of the test, so it took a few seconds longer using an allen key). I’m not used to a recumbent, I asked for the seat to be put into its most upright position, which took only a few seconds. Adjusting the neck rest was also a simple and fast job. The angle and width of the handlebars can be adjusted quite easily too, but in practice, on the narrow track model, there was very limited scope for doing this without the hands coming too close to the front wheels, and also limiting the steering movement (wider track models would not be so affected in this respect). As I’ve already mentioned, I’m not an experienced recumbent bicycle, or tricycle, rider, so some of the comments are just about how it feels to ride this machine, and I really can’t make any direct comparisons with any other recumbents, 2 or 3 wheel. My test ride was quite short - about 15 miles, but included some fairly steep descents, fairly steep ascents (though not long ones), level terrain, moderately rough roads and good roads, so I think that the only way in which it was not representative was to find so many different conditions in such a short ride! Such a short ride, especially with no prior experience of a machine of this type is really not enough to make final judgements, but I do think that it provided worthwhile indication of the experience of riding a recumbent trike, and the quality of the Trice QNT. As a non-recumbent-tricycle rider, I rather quickly discovered that it is even more essential with one of these machines not to get caught in too high a gear on an ascent, or when stopping - you can’t stand on the pedals! I was certainly conscious that riding this type of machine uses rather different muscles than riding a more conventional bike (most folders become ‘conventional’ in these terms!!). Not having developed those muscles, I found myself winching myself up moderate inclines in a lower gear than I might employ on an upright bike, but I was quite encouraged to find that I seemed to be finding it less effort even by the end of this short ride. Also, as you are sitting in a comfortable seat, and don’t need to worry about balancing, you can just concentrate both the physical and the mental effort on pedalling your way up. Descents are tremendous fun!!!! The steering lock is quite limited - not a problem in normal riding, but you need quite a lot of space to turn round, and manoevering in a confined space is awkward as well - a general characteristic of trikes with 2 front wheels (‘tadpoles’). I found the steering surprisingly quick in response (in terms of what I had expected, not having ridden any form of recumbent trike before) - though not in any way twitchy or lacking stability. The rear suspension on the QNT is REALLY effective - I was using the soft elastomer in its mid position, and this gave a quite remarkably smooth ride at the back, even on quite rough surfaces, deliberately looking for the potholes. The unsuspended front is rather more skittish (in the sense of up and down deflection and jolting, but with no effect on the steering), but of course unlike a conventional bike you aren’t leaning on bars at the front of the bike, so although you feel it a bit, it is only through general movement of the trike, not the jarring of a conventional bike. The 1.25 inch Kenda Kwests at the front seemed quite a suitable choice - possibly reducing the pressure a bit or fitting one of the narrower Big Apple tyres would give more compliance at the front, while fitting Schwalbe Stelvios might reduce rolling resistance, but would probably make the ride a bit rougher. I personally was quite happy with the machine as it was set up. One thing I noticed when riding with someone on a Trice Micro at Cyclefeast last year was that when he was talking while riding on some surfaces, his voice was vibrating, presumably as a result of vibarations of his body and the trike; during the test I rode briefly with a chap on a mountain bike, and though I wasn’t conscious of any vibration of the machine, my voice was ‘vibrating’ in the same way! As a novice, I did find I needed to resistant a temptation to push on the bars going up hills - no useful purpose would be served by doing this, it just seemed to correspond to the pulling on the bars of a conventional bike, which does seem to help on those machines. With the rear suspension, the ride at the back was very comfortable, and entirely acceptable at the front. The seat (a mesh type on the QNT) was comfortable too - though not surprisingly you need to make sure you don’t have any loose change etc in the back pocket of a cycling jersey (I did, and it made its presence felt quite quickly). I found the optional neck rest was a great asset. In normal riding, the brakes are superb when compared to a conventional bike. I didn’t try a very long, high-speed descent with a big load on board, and maybe drums would not perform as well as discs in such extreme conditions, but the drums fitted on the bike would meet all my needs, and have plenty in reserve. As expected, there was no sign of the independent front brakes affecting the steering in normal use - heavy braking on just one of the brakes did have a very slight effect, but was easily corrected, and represented wholly abnormal riding practice. Both brakes have a push button to activate a powerful parking brake (ie lock the brakes in the on position) - more necessary with a machine like this than a bike, since of course you can just leave it where it stands, not leaning or pointing at something to prevent it running away on a gradient. 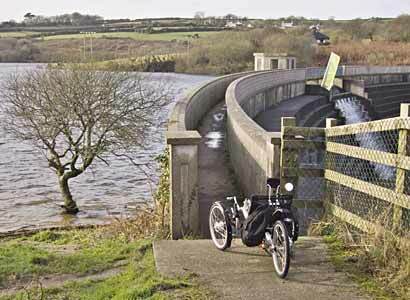 The handling of the QNT was superb - it felt very stable under all conditions; I rode it fairly conservatively - I’m not used to trikes, I didn’t know the roads at all, and it was not my machine, but with more experience and on familiar roads it would be tremendous fun, especially on descents. I found the twist grip gear changers entirely acceptable - some people do not like twist grips at all, and some don’t like them on recumbents. I would be quite prepared to live with them, though ICE do offer a bar-end shifter kit for those who can’t live with them. The test bike had the standard rings - 30/42/52, giving a range of 18.2 - 92.2 inches. As mentioned before, there is the possibility of either modifying this to 18.2 - 97.5 or 15.6 - 92.2 but not both the high and low ranges together! On this fairly short ride I used all the gears, and needed the smallest rings and the 3 largest sprockets quite a lot on some hills (partly due no doubt to the fact that the necessary muscles aren’t used to the exercise). Personally, I’d probably opt for the lower set by selecting the 26T ring in place of the 30, but younger and stronger riders might well like to go instead to the higher top gear. The machines are ready to accept a Rohloff 14-speed hub gear, and I think this might well be an attractive option, especially as it means that if you do ever find yourself in the wrong gear when stationary or at very low speed, you can change down. Gear changing was always quite positive, though not as silky-smooth as on some bikes I have ridden (I did not investigate adjustment, which might have eliminated this minor criticism). Although I’d started with the seat at its most upright position, and had found this comfortable (once I had removed the loose change from the back pocket of my cycling jersey! ), I think that with more use I would move to the middle angle - how good that you can change the angle (which you can’t on some makes and models of trike), and very easily too. Though this was a short test ride, it was moderately hilly; while the first few hills seemed quite hard work, I appeared to adapt quite quickly, and by the end was having less trouble, though still not climbing strongly or fast (I don’t on a conventional bike either!). I thoroughly enjoyed the ride, and was displaying the famous ‘recumbent grin’ when I got back! As mentioned earlier, many earlier Trices could be dismantled to pack into a reasonably compact space - the Mini could actually be fitted into a large Samsonite suitcase. However, this required tools and a some time to do it. The 2006 standard models have been designed to make the process of folding and separating the machines much easier, and not requiring any tools. Roughly, the sequence is as follows (I believe ICE will have a video of this on their web site soon): remove seat (QR), remove rear mudguard (QR), remove rear wheel (if necessary - QR), undo Velcro strap which prevents the suspension folding under if the bike is lifted, fold the rear forks under and stand the trike on these, contract the boom or remove it (QRs) depending on how small you want the package to be (first drop the chain off the front rings if removing the boom completely), remove the front wheels and unclip the brake cables. That’s it. 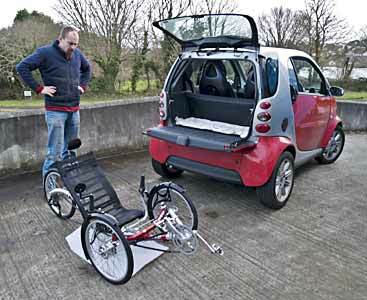 The whole process, including fitting it in the back of a Smart car, took about 2.8 minutes on the prototype, which did not have all the QRs fitted, and this was only the second time the job had been done ‘in anger’; with practice it should be possible to do it in 2 - 2.5 minutes. I didn’t time re-assembly, but I’d guess at 3.5 - 4 minutes maximum. The whole process is quite straightforward, and with a full QR set there are no tools required. While you would not want to be folding and unfolding several times a day and leaping on and off trains, that is not what it’s about for this machine, and to take it out by car, have a ride of a few hours, put it back in the car and go home, I find this entirely satisfactory. Of course, the amount of folding and disassembly could well be less, if you have a larger vehicle into which you want to put it, or you are just storing it in a more compact form at home (possibly just folding the rear suspension and wheel under to make it shorter. I think that ICE have achieved a very satisfactory and appropriate means of reducing the QNT and the other standard models to a form in which it can be transported and stored more conveniently. As mentioned, with the full fold the whole machine will fit in the back of a Smart Fortwo, without folding the passenger seat down. Not only that, but you can fit a Brompton in as well! If you were not carrying a passenger, and folded the passenger seat down, you would not need to remove the front boom, or perhaps even shorten it, and some of the other steps could quite possibly be omitted. Given the way that the machine folds and separates, I really don't think that quoting any specific dimensions is particularly useful, and the fact that it can easily be stowed in the Smart Fortwo car with the passenger seat in position, and room for a folded Brompton as well, is to my mind an effective way of describing the compactness of the bike (a folded Airnimal Chameleon and Micro will fit this space too, but are no easier to squeeze in). The listed weight of the QNT is 36.07lbs (16.36Kg) - not exceptionally light, but not unreasonable; as the machine actually splits into several parts, you would not need to lift anything like this weight to stow it in a car etc. 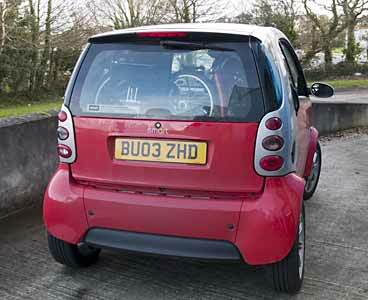 Above left: Everything fits in the Smart quite easily with the passenger seat still in place. 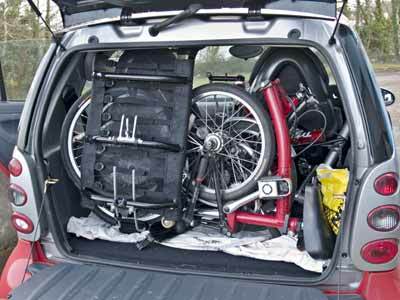 Right: move all the wheels and seat to the left, and there is room to put in a Brompton as well! Below: Yes, the boot can be closed too. It seemed a pity to take it out after putting it in there, but unfortunately ICE wanted their prototype QNT back! It’s really not up to me to say who will enjoy the recumbent experience, and certainly by the nature of things even folding models are not going to be as compact as those more conventional folding bicycles which are designed specifically for mixed-mode commuting. However, if a recumbent appeals to you, then the new Trice standard range for 2006 must be very high on your list of desirable machines. The rear suspension is very effective, and gives a very comfortable ride. Handling, braking and gearing are excellent, quality is beyond criticism, and the choice of components, and their quality, is appropriate. Portability, and bulk when stored, are addressed very effectively - under 3 minutes to fold/split, only a shade more to re-assemble, and a package which will fit into the luggage space of a Smart Fortwo, and still leave room for a Brompton for the passenger. With a larger vehicle to transport it, less disassembly would be required, and the process would be even quicker. ICE plan a carry bag for the folded/disassembled machine - using this, train travel would become quite feasible, though clearly the amount of assembly and disassembly means this is an option for a day ride, or start and end of a holiday, rather than something one would choose to do for daily commuting. In terms of value, this may be the 'standard' ICE range, but there are no compromises in terms of quality or components in any major areas. In the UK, these are excellent value compared with other trikes (a KMX of anything resembling an equivalent specification seems to cost not much less, and is not in the same league as the Trice for quality) and recumbent bikes - and indeed are a bargain compared with many reasonable quality conventional bicycles. I greatly enjoyed this first serious recumbent trike experience, and I can thoroughly recommend the Trice QNT and its stablemates. Delivery should start within a few weeks (of mid-January 2006), but not surprisingly ICE already have a healthy order book for these new machines. Peter Eland of Velovision will be testing the prototype very soon, and his more detailed, and more expert, report is expected in the next issue of Velovision - so please look out for that to get a second opinion.